With the last part of our coverage of the SEMA show and the cool things we saw there, we’ll wrap up with some more modifications that we saw on cars that we also offer on our website. 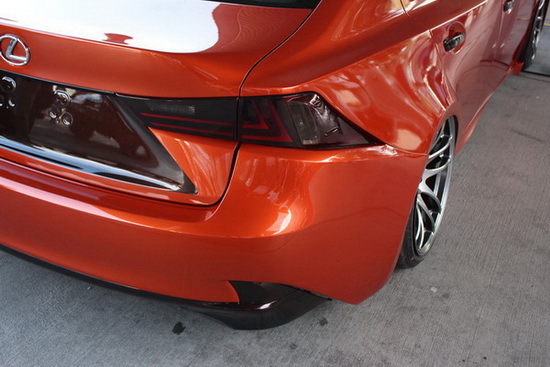 We saw many cars with tinted head and tail lights, a direct fit LED fog light assembly on a Scion FR-S and some multi-color interior lights! While these cars probably did not get them from us, it’s still pretty cool to see these types of products being used and hopefully it’ll give you an idea of what to do on your car. Vinyl tints are popular because they are easily installed and removed without any damage to the application. There are many colors to choose from, but the most common is the black dark tint which puts a darker shade on the application. If there are any issues with law enforcement or if you just don’t want the darker shade on anymore, you can easily peel it off and you can start off fresh again. 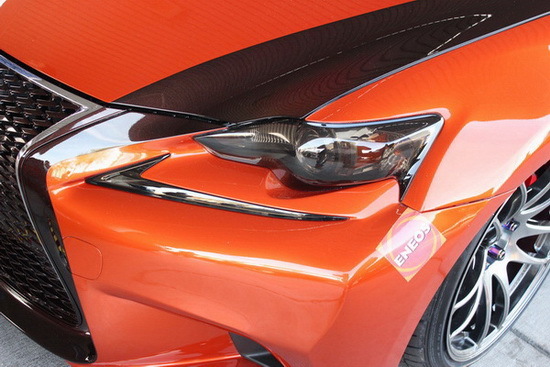 At this year’s SEMA event, there were quite a lot of Scion FR-S and Subaru BR-Z’s that made up a large percentage of the show vehicles inside and outside of the convention center. 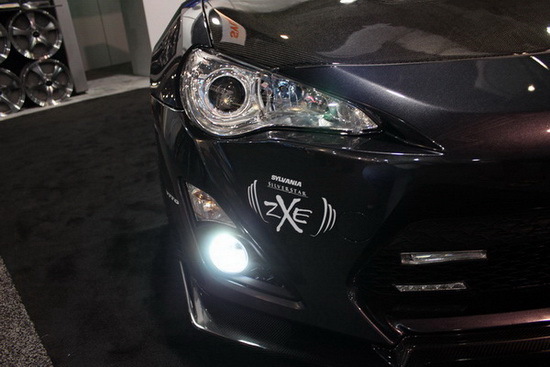 On this particular Scion FR-S, we saw an LED fog light assembly similar to what we carry lit up. Subtle upgrades such as this change the look of the vehicle quite dramatically. 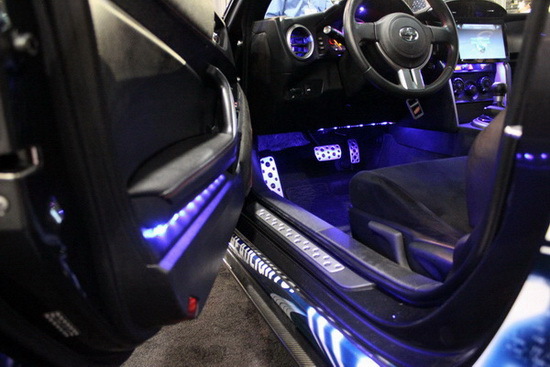 Last, but not least we saw a car with multi-colored LED interior lights underneath the dash and on the side doors. These lights were automatically cycling through the colors so they were most likely in the “Demo” mode function. 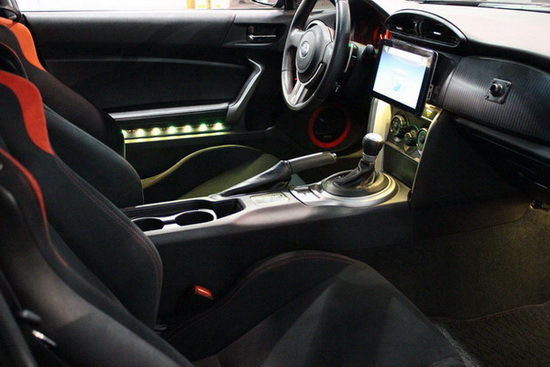 These easy to install lights connect directly to the car battery and are controlled at your finger tips with a radio remote control. Since LEDs draw such little power, there are no worries of the lights being in demo mode all day at the show and draining the battery. That is it for our coverage of SEMA. It is very fortunate of us to live within a reasonable driving distance of such a big event that happens every year in Sin City. We get to see all the creative and head turning builds of the year gathered together in one building. 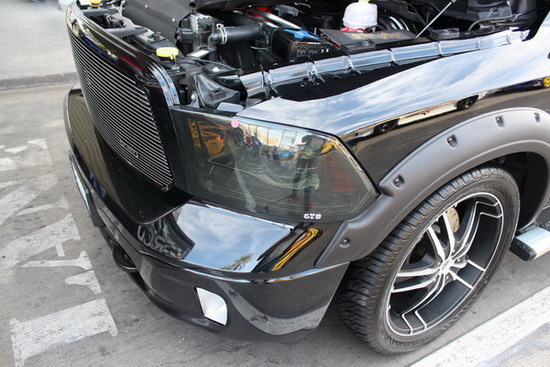 In addition to that, there is huge aftermarket support from automotive retailers and car manufacturers at SEMA. 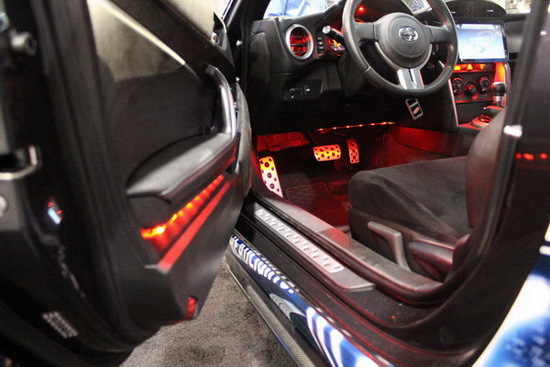 If you ever have a chance to go to SEMA, make sure you take that chance as it will be a memorable experience.